Belize NMS: Conditions will become moist and unstable as a cold front approaches the country. Relatively moist conditions will prevail for most of the week. 24-hour forecast: Mostly cloudy today and tonight. A few showers and isolated thunderstorms are expected mainly over northern and inland areas this afternoon, spreading to most areas tonight,then mostly south and coast tomorrow morning. Winds: North - northeast 5-15 knots. Today: Winds: N-NE 5-15 kt; seas: Choppy. ; waves: 2-3 ft.; a few showers and isolated thunderstorms mainly north. Tomorrow: Winds: N-NE 10-20 kt with higher gusts; seas: Moderate - rough; waves: 4-7 ft.; a few showers and isolated thunderstorms. Marine Outlook: Wednesday night:- Winds: NE 10-20 kt; seas: Moderate - rough; waves: 4-7 ft.; a few showers south. General Outlook: A few showers and isolated thunderstorms will occur over mostly over the sea Wednesday then mainly south Wednesday night. 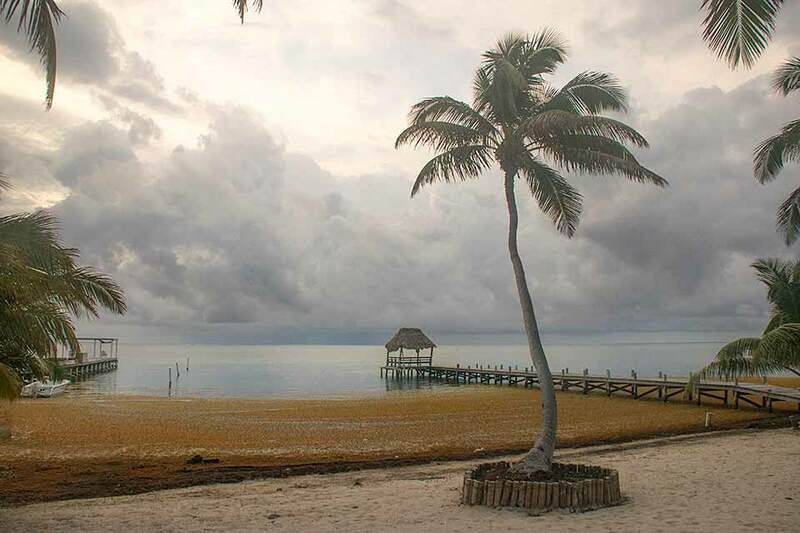 On Ambergris Caye this morning we have a breeze from the North at 6 mph and a flat sea. The expected high is 84f. North winds increase visibility for divers on the islands sites. A complex weather situation right now. The Caribbean winds are being held back east of Honduras, there is a warm bubble of air being driven down from the north by the cold front, which is clashing with the high level Pacific cloud from the SSW which has caused the first of the ITCZ type of swell-ups just south of us along the Pacific coast, and a whole bunch of then along a line near Panama. 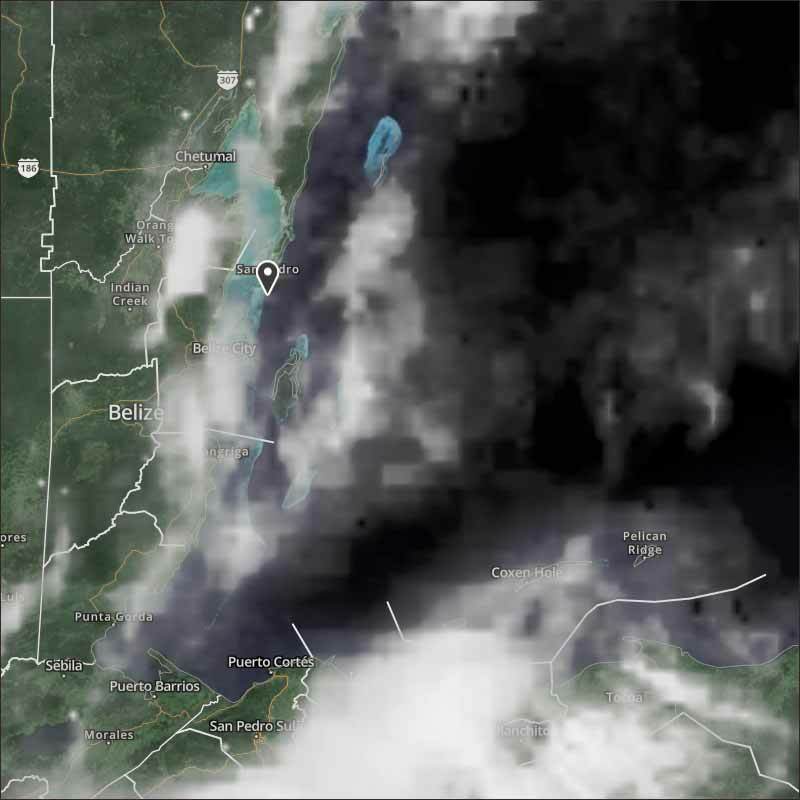 The cold front is pushing warm air down from the north resulting in a line of rain presently crossing over Belize, there have been significant rain in northern Belize, but now, most is out at sea. Looks like today is going to be mainly cloudy, with patches of rain this morning, occasional sun.